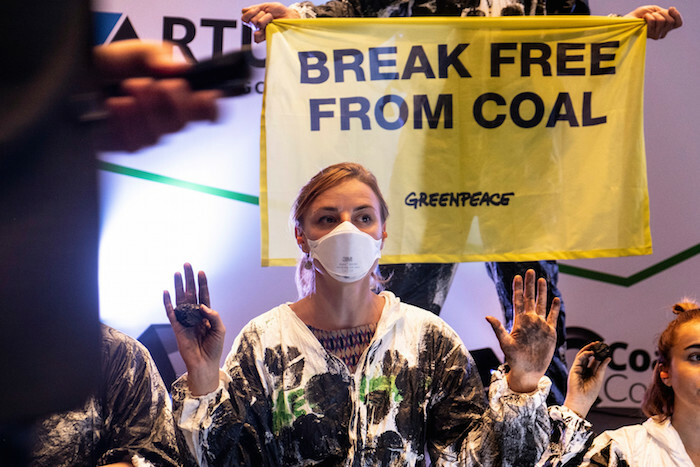 Barcelona, Spain – The World Coal Leaders Network 2018 meeting was disrupted today by 17 Greenpeace activists from Spain, France and Slovenia who peacefully protested the continued use of coal and demanded its rapid phase-out. A large banner reading “COAL DESTROYS LIVES” was deployed which exposed coal companies and traders as major contributors to climate change and air pollution that continue to threaten millions of lives. The activists urged European governments to discontinue their support of the “killer fuel”, particularly in the form of subsidies for coal companies, and plan for an immediate coal exit. “People across Europe and around the world are already standing up and demanding their governments to break free from coal. Noticeably in Germany more than 50,000 people rallied in Hambach forest to send an unprecedented anti-coal message. Germany, with the biggest coal fleet in Europe, has still not set a phase-out date. With an ambitious 2030 phase-out date, Germany could take back its climate leadership role in Europe –and globally,” added Adam Pawloff. Burning coal is the single biggest source of carbon dioxide emissions from human activity and is the number one driver of climate change . Further, studies show that air pollution from coal power plants alone is responsible for hundreds of thousands of premature deaths globally each year, including more than 22,900 in the EU [2, 3]. These numbers increase dramatically when industrial and domestic coal use are taken into account. This autumn, the EU leaders will decide whether or not a little-known type of subsidy –called capacity mechanisms –will be restricted by EU law. The payments are taken from the public’s pockets to supposedly ensure supply in case extra power is needed. A recent Greenpeace report showed that EU governments have already allocated €58 billion to prop up coal, gas and nuclear power plants through such schemes. 66% of all capacity mechanism subsidies in the EU go to coal plants alone.